Higher agreement between how well you can do something and how well you think you can do something increases the chance of successful goal-directed behavior for people of all ages. Therefore, correctly estimating physical abilities is essential to safely perform daily activities. This is accentuated in older adults, as physical abilities deteriorate with age. As a result, those unaware of their impairments may engage in unsafe and excessively challenging tasks, putting themselves at risk For example, if older adults overestimate their step-over ability, this may increase their risk of tripping over an obstacle, which could lead to falling. Our main research questions were to investigate whether older adults can assess their step-over ability accurately and whether an inaccurate perception—in particular, overestimation—is associated with a higher risk of accidental falls. A large sample of young (18–35 years; n = 71) and older (60–89 years; n = 494) participants performed our original step-over test (SOT). In this test, participants first observed a horizontal bar at a distance of 7 m and estimated the maximum height (EH) that they could step over. After their estimation, they performed the actual SOT to measure the actual maximum height (AH). Our results showed that 17.8% of community-dwelling older adults overestimated their step-over ability and failed to step over the bar at their EH. All young adults, on the other hand, succeeded in the SOT at their EH. Increased error between EH and AH (i.e., overestimation tendency) was significantly negatively correlated with AH in the older adults, with no significant correlation in the young adults. We also identified participants who had experienced falls in the 1-year period before the study. The number of older participants who overestimated their step-over ability among those with a fall history was almost double that of participants with no fall history (27.8% vs. 16.1%). Figure: Step-over test (SOT) and the relationship between the estimation error [Δheight, (EH-AH)/AH×100] and actual step-over ability (AH). (A) Participants first estimated their maximum height (estimated height, EH), and then their AH was measured. (B) A scatter diagram for Δ height and AH. The red squares represent the elderly participants, whereas the blue triangles represent the young participants. The positive Δ height values represent overestimations. Our results suggest that some older adults are not fully aware of their age-related decrease in their step-over ability and its association with their fall history. Older adults with low step-over ability had a tendency to overestimate their actual ability and therefore might put themselves unwillingly at an increased risk of falling. Improving this awareness and correcting this overestimation of physical capabilities can, potentially, be a new target for interventions. Sakurai R, Fujiwara Y, Ishihara M, Higuchi T, Uchida H, Imanaka K: Age-related self-overestimation of step-over ability in healthy older adults and its relationship to fall risk. BMC Geriatrics, 2013, 7(13):44. Ryota Sakurai’s research goal is to reveal the mechanisms in cognition-motor interrelationships. His research focuses on the characteristics of self-estimating physical ability and its relationship to fall risk. He currently focuses on the neural mechanism of the relationship between gait and cognitive functions, and to contribute to developing of effective intervention strategies to prevent gait and cognitive dysfunctions in seniors. 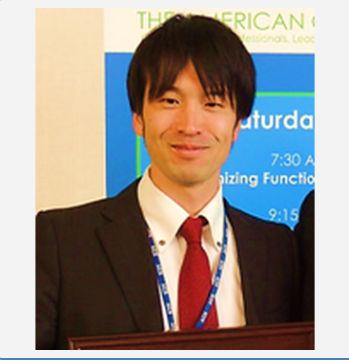 Ryota Sakurai is a postdoctoral fellow at the Faculty of Sport Sciences, Waseda University, Japan and Gait and Brain Lab, Parkwood Institute, University of Western Ontario and Lawson Health Research Institute, Canada (supported by the Japan Society for the Promotion of Science). The study presented here he performed as part of his doctoral work at the Health Promotion Science, Tokyo Metropolitan University. PreviousIs the self-assessment of fall risk the future?